I recently worked on a Jira Service Desk automation project. One of the requirements is to allow user to choose either Jira project or Confluence space from a dropdown list. 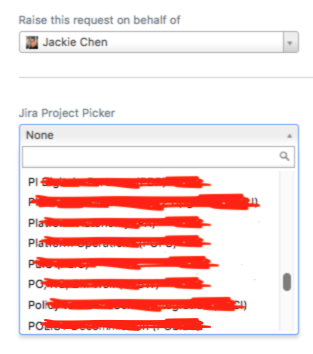 This is how the custom field of ‘Jira Project Picker’ looks like. BTW, I have confirmed that Jira (7.12.3 ) system field project field could not be used in Jira Service Desk (3.15.3) at the time of writing. As users add or remove projects all the time, so the Jira project list has to be updated frequently to reflect the latest stats. If you are interested to know how it works? Here you go, please check it out in my GitHub. Next Post Error rendering ‘com.atlassian.jira.jira-view-issue-plugin:activitymodule’. Please contact your Jira administrators.